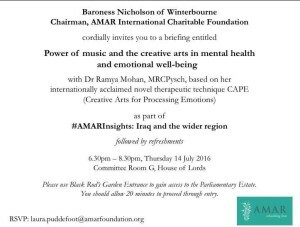 For the ‘AMAR Insights’ series, British South Indian Dr Ramya Mohan (Well-known Psychiatrist, Musician and Artist and global pioneer in blending science and art together for individual/ community development) , was invited by Baroness Nicholson of Winterbourne , Chairman of The Amar International Charitable Foundation (Patron HRH The Prince of Wales) , to talk about her cutting-edge neuro-scientific research on the power of music and arts to effect positive change in mental health and emotional well-being. She was asked to introduce her critically acclaimed therapeutic technique CAPE (Creative Arts for Processing Emotions) with an interactive practical demonstration and to discuss its applicability to post-war traumatised / displaced populations ( Especially children , young people and families). 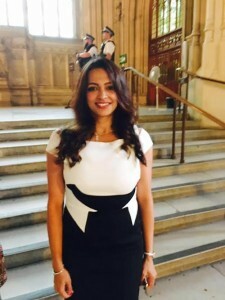 Dr Ramya Mohan is a highly regarded Senior Consultant Psychiatrist and Medical Educator on the National Health Service who, in 2015, founded iMANAS London, an organisation created to promote the integration of Medicine, Arts, Neuroscience and Ability in Society. She specialises in the use of music and creative arts in patients with mental, emotional and behavioural difficulties. Exploring the way in which we can harness the mind and brain’s potential, iMANAS London delivers its message and work through projects that bring Science, Medicine and the Arts together on global platforms. iMANAS supports the logical power of neuroscience (using up-to date, evidence-based research and clinical practice) and the therapeutic creativity and free expression of art. In May 2016, we had run a feature on Dr Mohan releasing her innovative, self-guided therapeutic technique ‘CAPE: Creative Arts for the Processing of Emotions’ with an illustrious panel at the cultural wing of the Indian High Commission UK (Nehru Centre), London. This novel technique has a basis in her Neuroscience research on music, emotions and the brain and brings together the best of Eastern and Western music with well-evidenced therapeutic techniques, to support self-guided emotional processing and regulation. Dr Mohan has conceptualised and developed CAPE – She supervised the research, brought together the formative structure , composed the vocals and lent her voice to the project. This collaborative project was with her research team (Navya Anand, Psychology assistant) and esteemed colleagues from the fields of creative arts (Music, Linguistics) and Medicine, including Dr MN Nandakumara (Executive Director of The Bharatiya Vidya Bhavan, London) ,Vidwan Balu Raghuraman (Violin faculty at The Bhavan and Trinity College, London) and Dr Amal Lad (GP and Musician) . 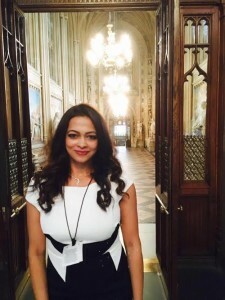 Following on from the success of CAPE’s pioneering approach, which was widely acclaimed in peer-reviewed international Psychiatry conferences and top world media ( Including the BBC, Independent UK and The Huffington Post ), Dr Mohan was asked to discuss her scientific findings and provide information about CAPE at the house of Lords to key influencers from the fields of politics, media, industry, trauma, humanitarian and community development work , music, medicine, psychiatry and psychology . This was with a particular focus on how CAPE could be used to to support post-war trauma and human crisis situations in the middle-eastern region using music and the creative arts. Dr Mohan’s interactive talk explored the close relationship between creative arts, music and mental well being. She discussed existing concepts and evidence around using music and creative arts (In parallel with medication / formalised therapy approaches or without). She discussed the role and significance of music and the arts in the management of extreme / long-term war-related psychological trauma (With particular consideration of the war-ridden regions of Iraq /Middle-East and the global humanitarian crisis originating in the region). This was applauded as a highly inspiring and insightful talk to an interested, receptive and enlightened audience. A keen interactive discussion and question/answer session facilitated by Baroness Nicholson of Winterbourne ensued. A practical demonstration of CAPE and its innovative approach was part of the talk. This gave the audience an opportunity to experience and keenly discuss the technique. The audience collectively explored CAPE’s potentially massive applicability /reach for victims of extreme war-related psychological trauma and human rights violations. CAPE was applauded as a unique and much needed approach, with its in-built flexibility for adaptation to a wide spectrum of difficulties (Including traumatised populations, women, children, depression, anxiety and milder adjustment/ emotional difficulties in the general population). This sounds like work that will really help a lot of people. We need these kinds of innovative therapies for the modern day stresses. All the best ! Very specific and informative summary of work being done by Dr. Ramya Mohan. Gives details of creative and beneficial initiatives she is pursuing.